And yes, it is indeed screwed into the wall. OMG. at least it is in a discreet location...sort of. haha! 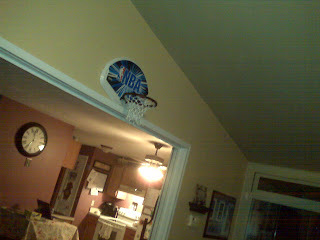 My kids have been playing bball in the house too. Of course, we have one of those Little Tikes bball goals up to the highest possible setting. I can't wait for spring either! He did not really do that? Did he? Oh, my God. Oh...I would kill my husband! I hope they are using nerf balls?? Oh my. My kids would have the house destroyed in one match!!! Looks like fun to me! Snowing here today in IL. Um, well, at least it's better than painting court lines on the floor? You should submit that to one of those design blogs. Awesome!